Auto enrolment has been introduced because people in the UK are living longer lives but not saving enough for retirement. The government estimates that as much as 7 million people do not have adequate savings to provide for them in retirement. The government will also be unable to cope with the increasing number of people retiring in the future. By law, every employer in the UK has auto enrolment (AE) duties to complete. Employers must enrol all eligible jobholders into an AE workplace pensions scheme. The employer must also contribute to the employee’s pension pot. It is called automatic enrolment because it is automatic for employees but it’s not automatic for employers. To comply with automatic enrolment, employers need to complete a number of AE duties, including employee assessment, communications, process employee requests, calculate contributions and deductions and submit files to the chosen pension provider. There will be additional duties to perform if the employer chooses to postpone AE. Employees will also have certain rights including being able to opt out, opt in or join the pension scheme. Employees can be given access to their own online self-service portal where they can access and download their payroll documents. Communicating with employees about their AE rights is a compulsory part of complying with AE. You must notify all employees about their worker category, give information about how AE applies and let them know their rights. BrightPay Connect can help with the process of sending AE communications. You will have the option of sending and making the AE communications available on each employee's online portal where they can view, download or print the letter. Part of an employer's duty is to calculate the correct contributions and deductions for each employee. This information should be visible on the employee's payslips displaying the employee and employer contribution amounts. BrightPay Connect allows employees to view and download all current and historical payslips. 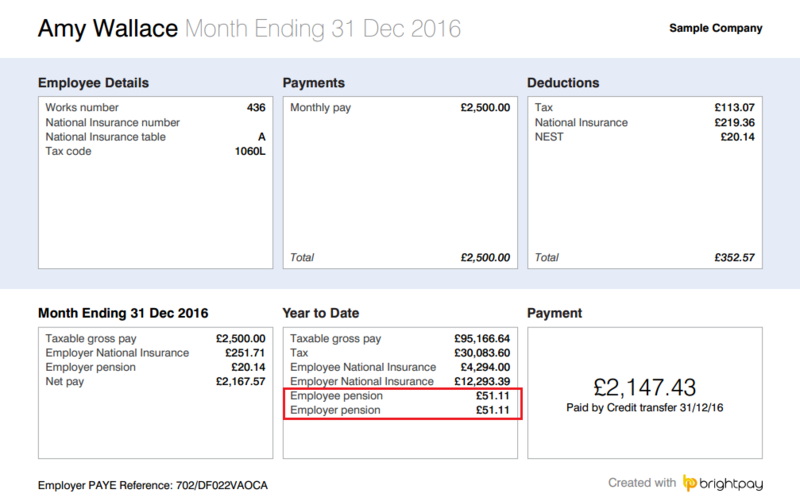 These interactive payslips will show these auto enrolment contributions for you. See a sample BrightPay payslip below. To ensure compliance, it is essential that your staff records are correct, including employee dates of birth, salaries, National Insurance numbers, contact details and amounts being paid into the pension scheme each pay period. Having the correct information will ensure you have what is needed to run auto enrolment effectively. On the employee portal, employees can keep their contact details up to date and make any changes should their contact details need to be modified. As BrightPay Payroll and BrightPay Connect are fully integrated keeping up to date with your AE staff records is easy. You are legally required to keep certain information and records for the purposes of AE. Poor record keeping could result in a fine being issued by the Pensions Regulator. All employers must provide certain information to the Pensions Regulator to let them know that they have complied with their AE duties. Auto enrolment reports can be set up and saved in your BrightPay payroll. Any saved reports will then be available to the payroll bureau and to the employer on BrightPay Connect. People want their information on the go. Payroll bureaus, employers and employees can access their payroll data on any smartphone, desktop computer, tablet or laptop. Accessing your payroll and auto enrolment data on BrightPay Connect allows the processes to be easier and more flexible. Online access also allows for better communication regarding automatic enrolment between workers, employers and bureaus. BrightPay payroll offers full auto enrolment functionality to take the hard work out of the employer duties for you. What’s more, there is NO additional charge for auto enrolment. Your payroll and auto enrolment duties must still be processed on the desktop BrightPay Payroll application. BrightPay can automate a lot of the administrative auto enrolment processes for you. Simply enter in the staging date and the rest is easy. When setting up your AE pension scheme, you will have the ability to set up your contribution rates too. Once you reach the staging date in BrightPay, the payroll will automatically assess all employees for you. From there, BrightPay will automatically produce the appropriate letters for each employee which can be printed, emailed directly to the employee, downloaded or uploaded to the BrightPay Connect self-service portal. Other AE tasks are seamlessly handled, including postponement, processing opt in, opt out or join requests, support for AE pension schemes and AE reporting. Find out just how easy the entire process can be. Book a BrightPay Connect demo today.